Large scale agriculture is at its most efficient when it has a reliable, uniform supply of juvenile plantlets to grow from. Cannabis culture is no different, and starting vegetation phase of growth from already hardened plantlets (as opposed to seeds) saves time and resources otherwise spent on attempting to propagate non-viable or substandard / undesirable seeds within a group. An additional advantage in regulated environments is that the entirety of permitted canopy space can be devoted to growing plants instead of maintaining vegetative mothers and clones. Clonal (that is, genetically identical) plantlets – derived either from mother plant cuttings, or other methods as discussed below – add the even more important advantage of maintaining uniform strain genetics, leading to predictable growth behaviour and mature plant characteristics such as THC and CBD content, terpene profiles, and other strain specific traits which are associated with a strain name and any downstream product branding. Also, clonal plants all reach milestone stages within a much narrower window than plants derived from seeds. Seeds, in contrast, are by their very biological nature genetic reassortants of their parental stocks, making each seed unique; useful for long term selective breeding programs where variety to select from is of use, but not at all desirable once a lineage is selected and uniform product is desired. Cannabis cultivators have of course known this for a long time. While seeds are used for some smaller scale growth applications, established growth operations almost all work via clonal mother plant cuttings. This ensures product uniformity, but is relatively labor intensive and requires significant physical space for the cutting and hardening stages. Mother plants have a finite lifespan and limited number of cuttings they may provide, making the method relatively slow to scale up. Finally, traditional mother and cut clone systems are susceptible to all of the same plant pathogens (such as Fusarium spp. or powdery mildew) that can infect vegetating and flowering cannabis crops. Infestation of mother plants and clones can in worst case scenarios lead to the complete loss of strain stock – a serious risk for the grower. A technique widely used in other branches of industrial scale agriculture has the potential to address all of these shortcomings of classical mother and cut clones, and do so economically and with vast scalability. As you’ve probably guessed from the title, this approach is tissue culture (“TC”). Tissue culture from plants involves taking a small amount of plant tissue which is induced to return to- and maintained in- a primitive stage (in the form of ‘calluses’). These cells can be propagated indefinitely in defined synthetic media; when plantlets are desired, some of these cells are taken out and then induced to differentiate into all of the different tissue that makes up a complete plant. The first benefit from the method is that these cells can be maintained in large quantities in very small volumes and can be expanded to hundreds of thousands of cells very quickly, and again, in very small volumes. The second benefit is in scalability; hundreds of thousands of plantlets can be induced in far less time and effort than creating mere hundreds of cuttings. A crucial third benefit of TC over traditional cloning methods is that by stringent control of the maintenance conditions, appropriate growth media additives, and proper handling techniques combined with good facility sanitation practices, strains can be maintained and propagated free of detectable pathogens (TC methods require aseptic handling and the presence of pathogens are readily detected and eliminated). So now we appreciate that TC can generate vast numbers of identical, healthy “calluses”; how do we go about turning these into plants that we recognize as plants, suitable to move forward to vegetation and flowering stages? The process generally involves taking callus stock, expanding the number of cells in liquid media as single cells, then plating individual cells in their own culture chambers, then add the appropriate growth factors and hormones that induce them to differentiate into all of the normal tissue types that make up complete plants; as the cells divide they will differentiate into roots, stems, and leaves. Once this differentiation proceeds, they grow into complete plantlets. When these plantlets reach around the 6-8” tall stage, these are then ready to pass on for handling as normal juvenile plants, without any differences in process for subsequent growth. An added benefit of TC processes is that calluses can be maintained long term without differentiation, at very low cost and low space requirements. Particularly for an operation wanting to maintain multiple strain types for long periods, but able to bring them into production quickly and in large numbers, TC is an economical and reliable solution. In summary, TC is a well-established method for the retention, clonal expansion, and on-demand production of vast numbers of intrinsically healthy, uniform juvenile plants while offering cost and space savings over traditional methods of any appreciable scale. TC methods are the industry standard for a wide range of agricultural or ornamental plant species – from blueberries to strawberries to birch trees – and going forward as cannabis production becomes mainstream industry and requires the associated scale and uniformity, TC methods will become the obvious method of choice for forward-thinking producers. Whether that comes via development of in-house expertise and infrastructure, or through contracting services out to established TC nurseries, is a matter of choice; but one or the other will surely become the gold standard for cannabis stock maintenance in the very near future. 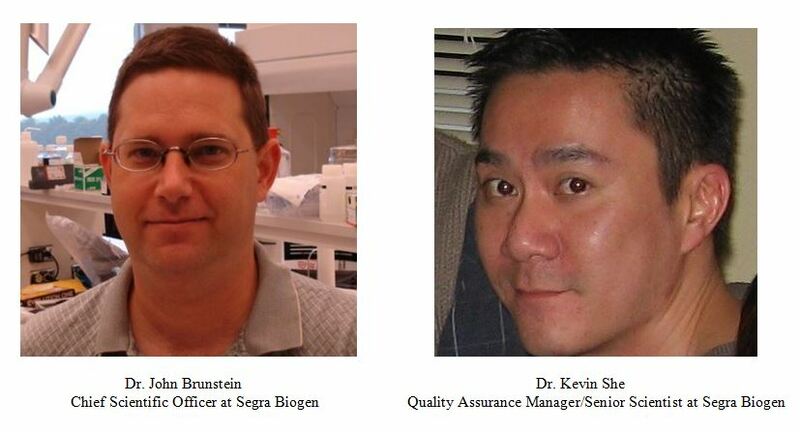 Dr. John Brunstein is the Chief Scientific Officer and Dr. Kevin She is the Quality Assurance Manager/Senior Scientist for Segra Biogenesis Corp. Segra is a cannabis sciences company focused on the standardization of cannabis products through the use of its Quality Management System, genotyping, and tissue culture.